Yes, there are some reasons to use the Java framework Vaadin. But there are many more disadvantages in my opinion. When I started to work with Vaadin, I quickly realized that this is not the framework I want to be an expert in. It was used in different projects across the teams and now the tendency is common – to get rid of it. Here are some thoughts on that matter – with lesson learned. However, if you are already there, you meet common problems very quickly. You have to be careful writing applications based on Vaadin. You can end up with spaghetti code. Vaadin misses coding guidelines in contrast to GWT, which it is paradoxically based on. Generated html and css is far from that you would like to see. It is incredible hard to customize your front-end. Finding the equivalent of html or css features on Java classes isn’t always so obvious. In spite of a rich interface, you often find yourself missing something special you need. Implementation of custom features takes time and energy. 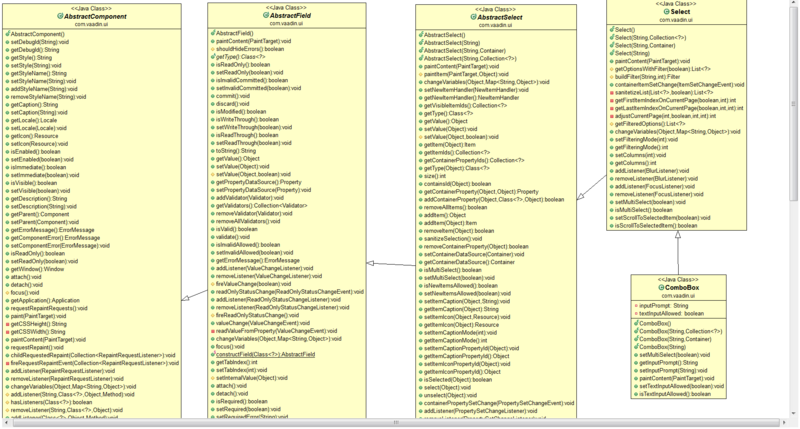 Vaadin component architecture is dominated by multi-level inheritance. You got lot of components and available plugins. The whole solution is built upon GWT under the hood. It is barely possible to get to know the whole call stack. Need to up stumbling terribly to know what and in what order to call to get your job done. The image below illustrates the controversial architecture. I counted a few hundred of methods accessible in one component – ComboBox – inheriting from four other classes. The quite catchy slogan of Vaadin – Thinking about U and I – does not reflect reality. Vaadin UI is very coarse and uncomfortable both in development and user experience. The Vaadin slogan much more refers to authors and to fact that they’re thinking about themselves only (?). Why write HTML in Java ? That’s the first question I asked myself starting to work with Vaadin, and I suppose it’s important to ask that yourself each time you are about to choose that framework. I can image only two scenarios mentioned before: – you are a java purist and do not want to get dirty coding the front part; – and you haven’t got front-end developers in your team. Decision not to enforce strict structure and instead let users choose the architecture and design patterns they like is controversial. It puts Vaadin Framework somewhere between being a “framework” and “toolkit”. In fact, it was called IT Mill Toolkit some years back. The reason for this is to allow others to build their tools and frameworks on top of Vaadin. To give flexibility for people building larger systems and having very specific needs. For the ones who want to learn the best practices from experts or get helped hands on in building their applications, Vaadin team offers trainings and consulting. Theming is complicated in any UI component set that supports wide set of browsers. This is unfortunate. After feeling the pain for years, we released http://vaadin.com/valo to alleviate this problem. Have you been using it? Regarding to deep inheritance: yes, there is a huge number of features in Vaadin UI components. Early on in the design we wanted to ensure that similar components would share API as much as possible to ease the learning curve. I hope most of the functionality is useful. But as always, not every feature is useful everyone. Regarding to the reasons why to use Vaadin you are spot on. This is a bridge from Java to Web without getting hands dirty. To be honest I’m a bit surprised that you talk about a concept of “toolkit” to allow others to build a framework on top of it. Vaadin is already an abstraction layer. Providing next layer on top of it sounds crazy for me. a) During my search for the most pragmatic framework for web development I find that vaadin is one of the easiest to learn. So I cannot share the opinion with the “bumpy learning curve”. c) Regarding MVC/MVP: Yes, I know that this is/are the “state-of-the-art” design patterns but honestly I can see a one major disadvantage and that is: That separation of concerns can cause a lot of extra work or limit the flexibility in getting the customer’s needs implemented. While I find it very useful to separate style into CSS, a further separation of logic is not always so easy. d) Regarding user experience: vaadin has IMHO one of the best user experiences around. Grid is still missing a few core features (like column width adjustment) or multi-column comboboxes are missing (or I simply haven’t stumpled upon a solution yet), but I cannot see other flaws here where other frameworks do better. c) I will not be argued on Separation of Concerns and state-of-the-art you declare to know. I will just one more time refer to the thing I said – if you are to provide the client with rich UI fast then you could choose Vaadin. This does not justify the mess you will have to live with and maintain. @Wildam. Wow! you read my mind about Vaadin. I just learned about it last week. Productivity is the key for using Vaadin. Gimmicks can still be done by custom components. At the same time I found Rapidclipse, IDE for vaadin, it brings productivity to next level. article is full of hate and with b.s. arguments towards the currently one of the best if not the best business gui framework available on the market. just to say that I’m using it years now, with full support of spring, postgres, apache shiro, highcharts, with high security within application as well within production linux servers and tomcat over https. Have you ever wanted to know what was the result of your unit test and act differently depending on the test result? 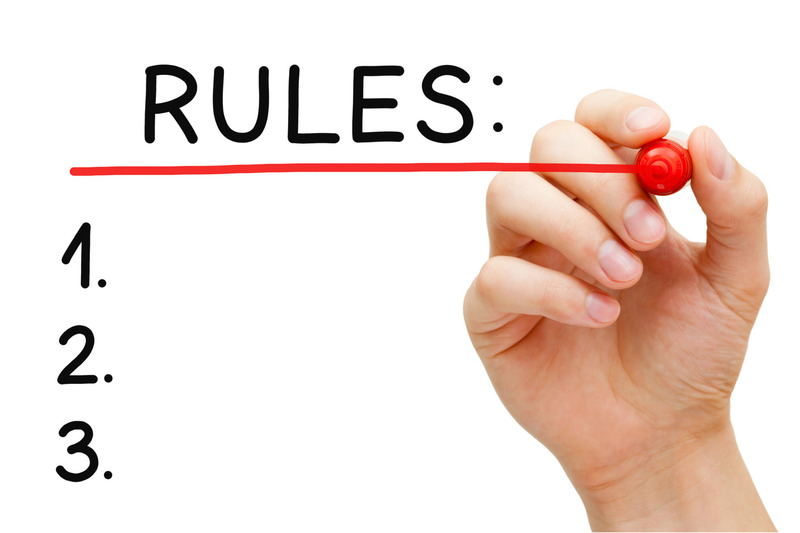 In this short article I present a JUnit feature called Rules….